-- Select a Size/Color -- Small Medium Large - Out of Stock! X-Large - Out of Stock! 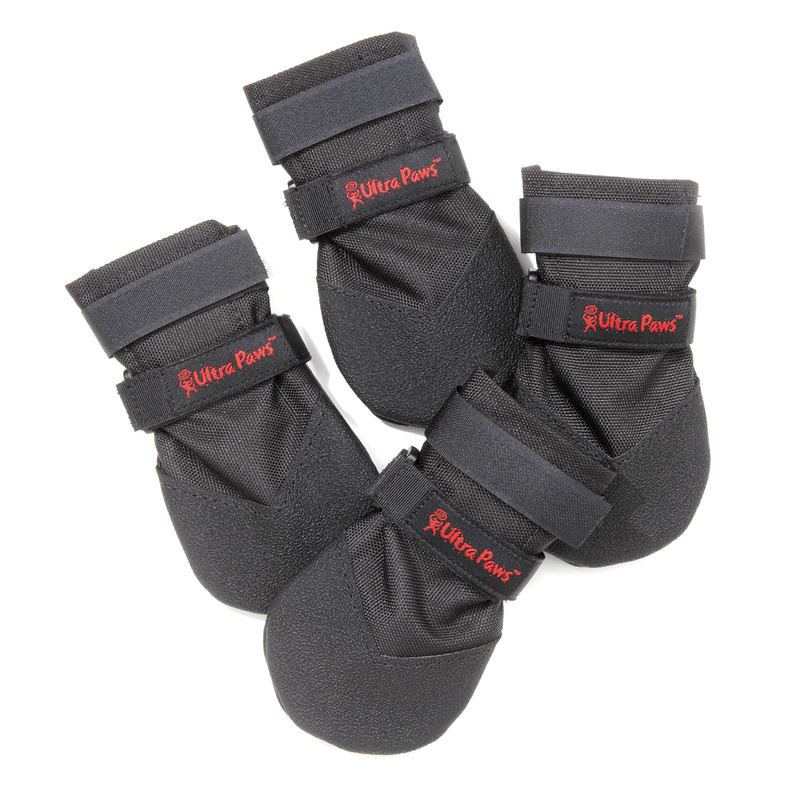 The Ultra Paws® Rugged Dog Boot is made with dense, water resistant but breathable nylon material and wrapped with a recycled tire material. Easy to put on - difficult to slip off. Side seams expand - making it easy to put on the boot. 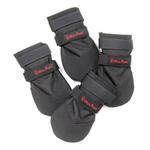 Two touch fastener® straps with slides fasten the boots closed. Foam at the closure cushions the dog's foot when the boot is tightened. This boot lives up to its name because it provides protection from most conditions - plus they'll stay on your dogs feet. The foam creates a secure grip - these boots stay on! Tough, water resistant 1000 denier nylon material with the top of the toe wrapped in Toughtek®. The sole is made of recycled tire material that is flexible, skid resistant and durable. The Rugged sole is up to 1.2 mm thick. The recycled tire material performs in wet and dry, hot and cold conditions. The Rugged sole is less pliable and suited for tougher conditions. To wash: Loosely fasten touch fastener closure, wash in cold water delicate cycle; hang to air dry. Try our new printable size chart for Ultra Paws Boots! (Click the link to begin the PDF download.) Once the size chart has printed, simply place your pup's paw on the paper to determine the best size for your pet. 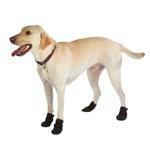 Measure your dog’s front paw to ensure a comfortable fitting boot. If you prefer not to print the measuring guide, use a plain piece of paper. Place the paw on a piece of paper and press down on the top, mimicking how the paw spreads when the dog’s walking. Mark the left and the right side on the paper and measure the distance between the marks. Compare this to the boot sizes. 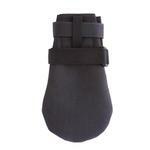 The width of the paw should be smaller than the boot size, for all boots except Traction (they can stretch a little). For example, if the foot width is 1 1/2 inches, order an X-Small at 1 3/4 inches. Success varies depending on the surface on which your dog is walking or running. Boots will show wear; the material used, while durable, are still fabrics. The more abrasive the surface, the faster the boot will show wear. Wear includes tears, holes, etc. and we can not accept returns in this condition. We've found that using "Shoe Goo" to repair holes or tears works well and gives your boots a longer life. Unfortunately, there isn't a perfect solution for dogs that drag their feet. - we haven't found a material that will stand up to dragging and still be comfortable for the dog. Some customers apply Shoe Goo as wear appears. Exposure to chlorine will cause the dog boots to deteriorate quickly and are not suitable for use in chlorinated situations. 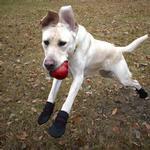 Ultra Paws Rugged Dog Boots - Black Customer Photos - Send us your photo! Our sweet playful Kodi decided to take a rest from some snow fun wearing his Ultra Paws Rugged Boots... he won't go anywhere in the snow without them! He's also wearing his favorite Baxterboo Blue Snow Coat that keeps him warm and dry. We're very happy to buy quality products from Baxterboo because their consistent customer service and online experience is top notch... Thanks Baxterboo! Posted On 01/02/19 by Jennifer S from Morristown, TN Yes, Jennifer S recommends this product! Great boots! They're useful and cute! Posted On 05/18/17 by Morgan W from Edson , Yes, Morgan W recommends this product! I love these boots, I bought them for the convenience of putting Kona (my golden retriever) outside when it's muddy or gross out so I don't have to wipe her feet when she comes in again. She hates it as much as I do so when the boots arrived I was thrilled. It took her a while to get used to them as I think they were a little tight at first, I ordered a small, but once they stretched a bit they were great. Super easy to put on and take off, but she has yet to shed one on her own. 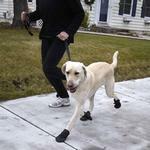 As a bonus they offer a little more protection for her feet when we go for long rides in the bush or along a hard road. Posted On 10/13/15 by Jennifer S from Morristown, TN Yes, Jennifer S recommends this product! I really, really like these boots but Henry walked with his hind legs way, way up in the air whenever he has them on. It takes several times of wearing them before he gets used to them. Great for winter weather and for protecting his paws. Posted On 10/25/13 by Rick B from Snoqualmie, WA Yes, Rick B recommends this product! The front of the boots tear when my dog walks on the sidewalk. He has Degenerative Myelopathy so he drags his toes repeatedly, this causes the front edge of the boots to wear out pretty quickly. I am considering the idea of painting the booties with Bed Liner to see if this toughens them up enough for my application. Can't wait to get my items! Look great and prices better than other places!